The Rift Valley Institute’s Impact of War on Somali Men (IWM) study is a project which fills a critical knowledge gap on the impact of war and state collapse on Somali men and manhood. It provides important insights for national Somali-led policy and practice, and supporting international interventions. It also widens the lens on gender in conflict to understand the vulnerability of men and how that impacts on families and society in general. Phase I consisted of a six-month inception study, hosted by RVI and funded by the LOGiCA World Bank trust fund. 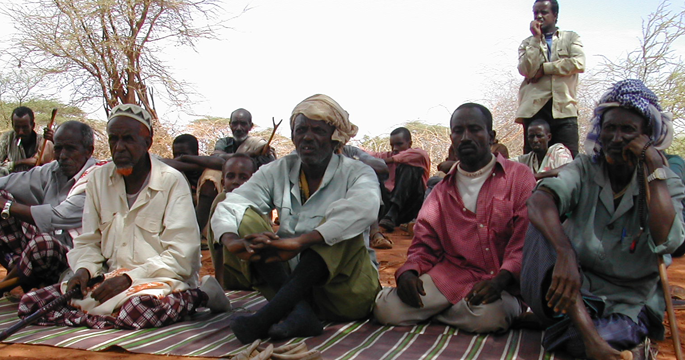 The research questions aimed to shed light on what it is like to be male in Somali society today including men’s increasing challenges to uphold their expected roles and responsibilities, and how this gendered identity determines and limits their opportunities, as well as their other identity markers such as clan, class, age, and social and marital status. Working with a team of experienced Somali male and female researchers in association with the University of Hargeysa and Puntland State University, the inception study generated a wealth of testimonial evidence, collected from over 400 men and 90 women in South Central Somalia, Puntland, Somaliland, and in the Kenyan Dadaab refugee camps as well as the Nairobi suburb, Eastleigh. Many men told researchers that this was the first time they had ever been asked to talk about their lives. The findings and preliminary analysis are presented in an inception report, authored by Judith Gardner (research coordinator) and Judy El Bushra (gender and conflict advisor), and two RVI briefings. The research is also published in the Gender and Development Journal. One of the 44 life stories collected from across the Somali regions was that of Mohamed Geeldoon. From this story, RVI published the first-hand account, We Kissed the Ground, which recounts the experiences of a young man from Somaliland who went on tahriib. Tahriib is an Arabic word referring to a form of unregulated emigration which involves a large number of young Somali men and women who leave for Europe via Ethiopia, Sudan and Libya, and thence across the Mediterranean Sea. The interview on which this narrative is based took place on 8 January 2014.